The folding bike's history has been one of gimmickry; a single redeeming quality, offset by impractical, unreliable designs and substandard components. 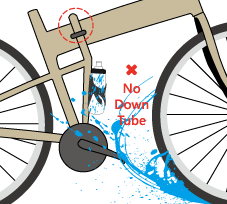 It has been a solution in search of a problem; too flimsy for the serious cyclist, too gimmicky for the casual rider, and about to become obsolete. CHANGEBIKE proudly offers a new member to an old family. Not a folding bike, but a bike that folds. The Change represents a revolution in cycling technology. It is the only bike of its kind to be ISO 4210-certifed, meaning that it can hold its own with any mountain bike, both in specs and looks. But that's just the half of it. The unit has the smallest folded state of its kind, and weighs less than ten kilos, making it small enough to fit in your trunk and light enough to be picked up with ease. The folding is easy and toolless and the design is sturdy and comfortable. The Change bicycle, from CHANGEBIKE, is the only bike you'll ever need. 27.5 inch/700C full size bike is low center of gravity, allowing greater stability. 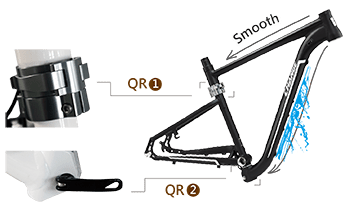 Single beam design has long lever arm which fits lower tolerance small folding bike. Yet, it is high certer of gravity, unstability, easy to fall down when riding downhill rapidly. Multi-size frame available (17", 19", 21" / 460mm, 490mm, 520mm, 550mm) to meet people of different height and ergonomic. Front triangle frame enables folded ( close to a 27.5-inch/700C wheel size) that can be easily placed in the trunk and the front wheel can be fixed on special natch to prevent scratching the bike body.